I posted this picture last night on Instagram and Twitter. It’s the last week before starts and we’ve thrown out all the rules and are allowing the kids to stay up VERY LATE. Guess what we are doing??? Playing Disney Infinity. And I am right there with them. I tweeted the Disney folks and I’m pretty sure they thought I was a teenager. Whatever. I’ll take it. My hair was in a bun and I had no makeup on. That’s a pretty nice compliment if you ask me. Anyway, we have been insane the last few days. I’m talking 4 hours at least because I KNOW that once school starts – reality will smack us in the face and homework / after school activities / play dates will begin. This will be short lived. For the time being, we are really enjoying ourselves!! Caleb was sleeping THANK GOODNESS – but Bill and Natalie were also on the bed. They were just doing something else. So, it’s all of us crammed on my bed spending time together and embracing the last few late nights of summer. I wouldn’t have it any other way. 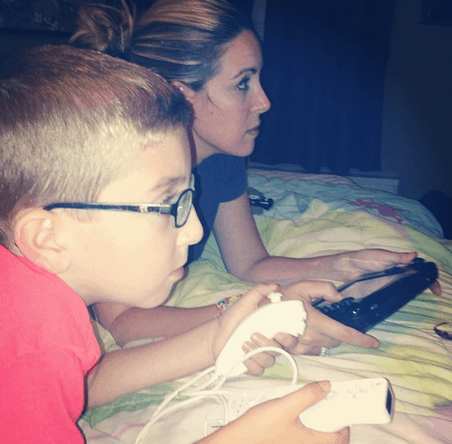 Are your kids gamers? Have you checked out the Disney Infinity yet? We simply cannot get enough.